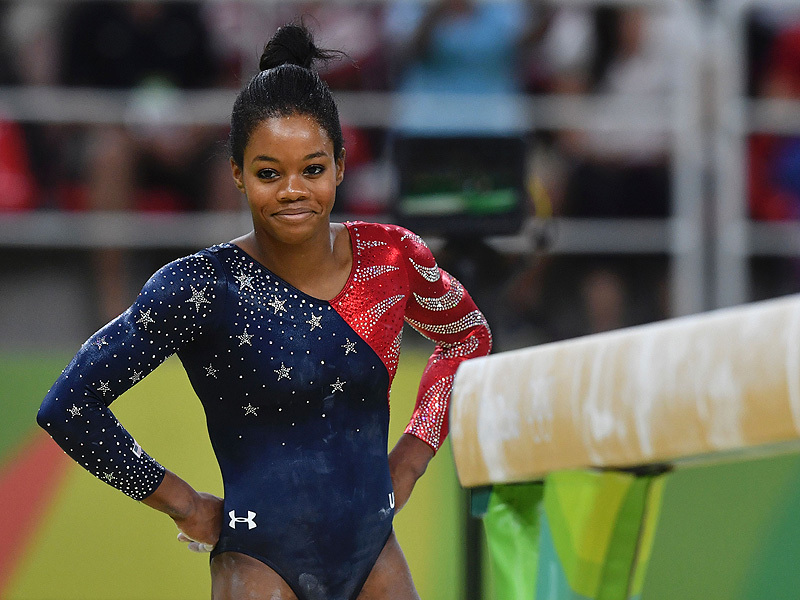 Gymnast Gabby Douglas in Rio. The Twitterverse can be very petty. After the US women’s team dominated the team gymnastics competition and won gold at the Rio Olympics, gymnast Gabby Douglas got hit by a social media storm. Why? Because she did not have her hand over her heart during the medal ceremony. One of the uglier images that made the rounds was an image of two photos placed in contrast to each other: one of the US women’s gymnastics team and the other of the US 4×100 men’s freestyle swim team. The top caption was “Understand the difference”. Under a picture of the swim team, in which Ryan Held is wiping tears from his eyes, are the words “took hand off of heart momentarily to hide tears of pride, joy, and accomplishment.” Underneath the picture of the US women’s gymnastics team, which shows Gabby Douglas with her hands at her side, are the words “blatant disrespect”. Douglas is an American star of the 2012 London Olympics, a member of arguably the hardest working gymnastics team in history, who has spent countless days and hours in practice and pain to help bring golden glory to the US again in Rio. Here she was, being ripped apart online because she did not have her hand on heart. In response to a few tweets I saw tonight, I always stand at attention out of respect for our country whenever the national anthem is played. I never meant any disrespect and apologize if I offended anyone. I’m so overwhelmed at what our team accomplished today and overjoyed that we were able to bring home another gold for our country! Douglas had no reason to apologize. Fortunately, the better angels of the Twitterverse nature agreed, and came to Douglas’ defense. But we’ve seen this movie before. In 1968 at the Mexico City Olympics, Tommie Smith and John Carlos were expelled from the Olympic Games after their respective first and third-place finishes in the 200-meter finals because they lowered their heads and raised their fists in protest of the state of Blacks in America. In 1972 at the Munich Olympics, Dave Wottle won the 800-meter finals in dramatic fashion. At the awards ceremony, he stood at attention, his hand on heart and his trademark white golf cap on head during the playing of the American national anthem. Well, tongues wagged, and the press kept asking Wottle if he was protesting something. Wottle replied very sheepishly that he simply forgot he was wearing it. Wottle is lucky that the Internet was not a factor our lives yet. And for decades, the simple act of carrying the flag in the opening ceremony was a matter of consternation for Americans. Perhaps it’s the fact that America was born out of war of independence from a King in Europe. But it became customary for the flag bearer leading the American team in an Olympic opening ceremony would not dip their flag to the host country’s leader as sign of respect. While Americans dipped and not dipped over the decades, the USOC then decided in 1936 after the Berlin Games to make it policy for the US flag bearer not to dip. Americans can have thin skins. Raw interpretations of what acts, what behaviors, what words are viewed as patriotic are openly voiced at the water cooler, in the press, and of course in the 21st century, most flamboyantly on the internet. This is true in sports competitions between nations as it is true in the political discourse of the US presidential campaign. Posted in Geo-politics, Gymnastics, Other Olympics, Rio Olympics, Track and FIeld and tagged 1964 Tokyo Olympics, 1968 Mexico City Olympics, 1972 Munich Olympics, 2016 Rio Olympics, Abraham Lincoln, avery brundage, Dave Wottle, dipping flag, Gabby Douglas, John Carolos, Tommie Smith, Twitter. Bookmark the permalink. Please check your facts more carefully. Tommie Smith and John Carlos did not have their medals confiscated in 1968. Thank you for that Tom! I stand corrected! And I’ve edited the article to explain that they were expelled. You’re right, their medals were not confiscated.